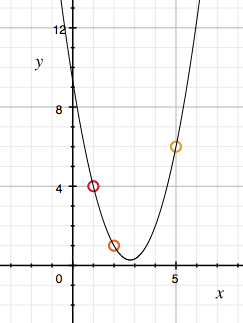 Recall from the Linear Lagrange Interpolating Polynomials page that given two points, $(x_0, y_0)$ and $(x_1, y_1)$ where $x_0$ and $x_1$ are distinct, we can construct a line $P_1$ that passes through these points. 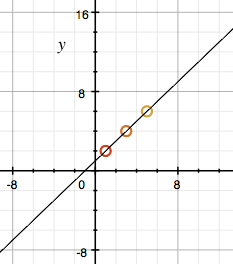 We also saw that we could approximate a function with this line that also passes through these two points. Note that $P_2$ does in fact pass through all the points specified above since $P_2(x_0) = y_0$, $P_2(x_1) = y_1$, and $P_2(x_2) = y_2$. A formal definition of the polynomial above is given below. Definition: The Quadratic Lagrange Interpolating Polynomial through the points $(x_0, y_0)$, $(x_1, y_1)$, and $(x_2, y_2)$ where $x_0$, $x_1$, and $x_2$ are distinct is the polynomial $P_2(x) = y_0L_0(x) + y_1L_1(x) + y_2L_2(x)$. It is important to note that while we define $P_2$ to be the "quadratic" Lagrange interpolating polynomial, it is possible that $P_2$ may have degree less than $2$. Let's now look at some examples of constructing a quadratic Lagrange interpolating polynomials. Construct the quadratic Lagrange interpolating polynomial $P_2(x)$ that interpolates the points $(1, 4)$, $(2, 1)$, and $(5, 6)$. Construct the quadratic Lagrange interpolating polynomial $P_2(x)$ that interpolates the points $(1, 2)$, $(3, 4)$, and $(5, 6)$. Note that example 2 shows that $P_2$ need not be quadratic and may be a polynomial of lesser degree.